Note: If the Graphtec Studio is used on the MAC OS X 10.5, the Graphtec Studio needs to be used in the Ver.2.1.200. (*) The firmware needs to be the follwong version. (*2) In the Graphtec Studio version Ver.2.1.874 or the later, it can not be used in the Mac OS X 10.5 even if the Mac OS X 10.5 is included in the system requirements on the user's manual for the Grajphtec Studio. 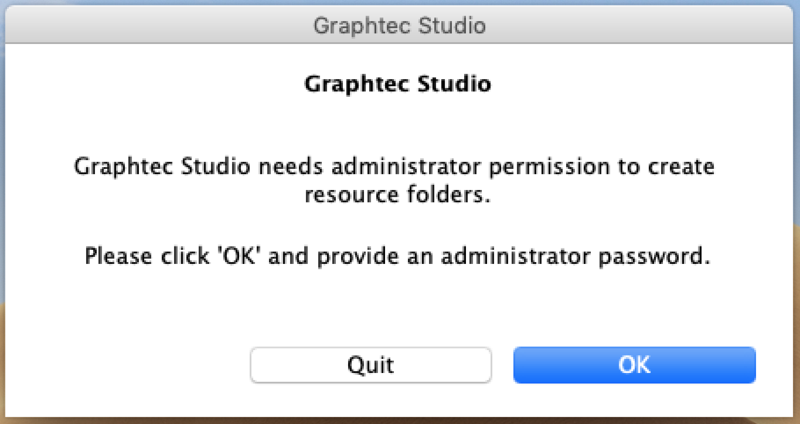 (*4) When it is used with macOS 10.14 (Mojave), a dialog asking for "administrator permisson" and "not optimized" may be displayed after the Graphtec Studio is started at first time. It is required to click the OK button to start Graphtec Studio. (*1) The firmware needs to be the follwong version. mac0S 10.14 Oct. 26, 2018 In ver.2.2.1267, compatibility with macOS X 10.14 has been verified. mac0S 10.13 Oct. 27, 2016 macOS 10.13 has been corresponded in ver.2.2.1267. mac0S 10.12 Dec. 7, 2016 macOS 10.12 has been corresponded in ver.2.2.1216. MAC 0S X 10.11 Jan. 13, 2016 Mac OS X 10.11 has been corresponded in ver.2.2.1070. MAC 0S X 10.10 Dec. 3, 2014 In ver.2.1.200, compatibility with MAC OS X 10.10 has been verified. MAC 0S X 10.9 Jan. 1, 2014 In ver.2.1.200, compatibility with MAC OS X 10.9 has been verified. Corresponded to the macOS 10.14 (Mojave). Corresponded to the macOS 10.13 (High Sierra). Fixed the problem that an error may occur under certain conditions when specifying the Relative to Media on the Configure Position and Size setting in the Tiling panel. Added languages to the Language drop down menu on the Advanced tab of the Cutters panel when the FCX2000 is used. Selectable from the English, French, German, Italian, Portuguese, Russian, Spanish, Chinese (Simplified), Korean,Japanese. Fixed the problem that a part may not be recognized as a contour within the specified extraction area when the Trace was executed with the some file. Corresponded to the macOS 10.12 (Sierra). Fixed the problem that the Graphtec Studio may not start by double-clicking the *.gstudio file in the Mac OSX 10.11. Corresponded to the Mac OS X 10.11 (El Capitan). Fixed the problem that the cutting condition change on cutter may not affect when the [Auto-release cutter connections when not in use] was selected in the [Cutters] on the [Preference] and the [As Cutter was selected on cutting condition] setting menu. Fixed the problem that the searching mark for next object may be not executed after the scanning error occurred in the FC8600 when the [Cut by Registration Segment] is used. Fixed the problem that an error message may be appeared after the reset was executed on the [Weed Setting] or [Tiling] panel when the stored gstudio file was used.